The Mahabodhi Temple, a UNESCO World Heritage Site, is one of the four holy sites related to the life of the Lord Buddha, and particularly to the attainment of Enlightenment. The first temple was built by The Indian Emperor Ashoka in the 3rd century BC, and the present temple dates from the 5th century or 6th century AD. It is one of the earliest Buddhist temples built entirely in brick, still standing in India, from the late Gupta period. 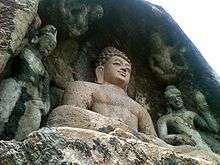 Rock-cut Lord Buddha Statue at Bojjanakonda near Anakapalle of Visakhapatnam district in Andhra Pradesh. With the reign of the Buddhist Mauryan Emperor Ashoka, the Buddhist community split into two branches: the Mahāsāṃghika and the Sthaviravāda, each of which spread throughout India and split into numerous sub-sects. In modern times, two major branches of Buddhism exist: the Theravāda in Sri Lanka and Southeast Asia, and the Mahāyāna throughout the Himalayas and East Asia. Buddhism remains the primary or a major religion in the Himalayan areas such as Sikkim, Ladakh, Arunachal Pradesh, the Darjeeling hills in West Bengal, and the Lahaul and Spiti areas of upper Himachal Pradesh. 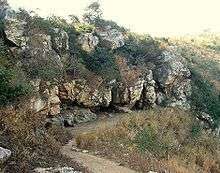 Remains have also been found in Andhra Pradesh, the origin of Mahayana Buddhism. Buddhism has been reemerging in India since the past century, due to its adoption by many Indian intellectuals, the migration of Buddhist Tibetan exiles, and the mass conversion of hundreds of thousands of Hindu Dalits. 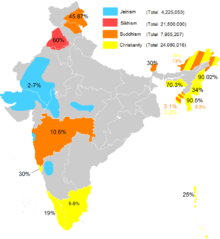 According to the 2001 census, Buddhists make up 0.8% of India's population, or 7.95 million individuals. Buddha was born in Lumbini, in Nepal, to a Kapilvastu King of the Shakya Kingdom named Suddhodana. After asceticism and meditation which was a Samana practice, the Buddha discovered the Buddhist Middle Way—a path of moderation away from the extremes of self-indulgence and self-mortification. Siddhārtha Gautama attained enlightenment sitting under a pipal tree, now known as the Bodhi tree in Bodh Gaya, India. Gautama, from then on, was known as "The Perfectly Self-Awakened One," the Samyaksambuddha. Buddha found patronage in the ruler of Magadha, emperor Bimbisāra. The emperor accepted Buddhism as personal faith and allowed the establishment of many Buddhist "Vihāras." This eventually led to the renaming of the entire region as Bihar. At the Deer Park Water Reservation near Vārāṇasī in northern India, Buddha set in motion the Wheel of Dharma by delivering his first sermon to the group of five companions with whom he had previously sought enlightenment. They, together with the Buddha, formed the first Saṅgha, the company of Buddhist monks, and hence, the first formation of Triple Gem (Buddha, Dharma and Sangha) was completed. Buddha died in Kushinagar, Uttar Pradesh. Followers of Buddhism, called Buddhists in English, referred to themselves as Saugata. Other terms were Sakyans or Sakyabhiksu in ancient India. Sakyaputto was another term used by Buddhists, as well as Ariyasavako and Jinaputto. Buddhist scholar Donald S. Lopez asserts they also used the term Bauddha, although scholar Richard Cohen asserts that that term was used only by outsiders to describe Buddhists. The Sattapanni caves of Rajgir served as the location for the First Buddhist Council. The Northern gateway to the great Stupa of Sanchi. The Buddha did not appoint any successor, and asked his followers to work toward liberation. The teachings of the Buddha existed only in oral traditions. The Sangha held a number of Buddhist councils in order to reach consensus on matters of Buddhist doctrine and practice. What is commonly called the Third Buddhist Council was held at Pāṭaliputra, and was allegedly called by Emperor Aśoka in the 3rd century BCE. Organized by the monk Moggaliputta Tissa, it was held in order to rid the sangha of the large number of monks who had joined the order because of its royal patronage. Most scholars now believe this council was exclusively Theravada, and that the dispatch of missionaries to various countries at about this time was nothing to do with it. The Dharmaguptakas made more efforts than any other sect to spread Buddhism outside India, to areas such as Afghanistan, Central Asia, and China, and they had great success in doing so. Therefore, most countries which adopted Buddhism from China, also adopted the Dharmaguptaka vinaya and ordination lineage for bhikṣus and bhikṣuṇīs. During the early period of Chinese Buddhism, the Indian Buddhist sects recognized as important, and whose texts were studied, were the Dharmaguptakas, Mahīśāsakas, Kāśyapīyas, Sarvāstivādins, and the Mahāsāṃghikas. Complete vinayas preserved in the Chinese Buddhist canon include the Mahīśāsaka Vinaya (T. 1421), Mahāsāṃghika Vinaya (T. 1425), Dharmaguptaka Vinaya (T. 1428), Sarvāstivāda Vinaya (T. 1435), and the Mūlasarvāstivāda Vinaya (T. 1442). Also preserved are a set of Āgamas (Sūtra Piṭaka), a complete Sarvāstivāda Abhidharma Piṭaka, and many other texts of the early Buddhist schools. Several scholars have suggested that the Prajñāpāramitā sūtras, which are among the earliest Mahāyāna sūtras, developed among the Mahāsāṃghika along the Kṛṣṇa River in the Āndhra region of South India. The earliest Mahāyāna sūtras to include the very first versions of the Prajñāpāramitā genre, along with texts concerning Akṣobhya Buddha, which were probably written down in the 1st century BCE in the south of India. Guang Xing states, "Several scholars have suggested that the Prajñāpāramitā probably developed among the Mahāsāṃghikas in southern India, in the Āndhra country, on the Kṛṣṇa River." A.K. Warder believes that "the Mahāyāna originated in the south of India and almost certainly in the Āndhra country." Anthony Barber and Sree Padma note that "historians of Buddhist thought have been aware for quite some time that such pivotally important Mahayana Buddhist thinkers as Nāgārjuna, Dignaga, Candrakīrti, Āryadeva, and Bhavaviveka, among many others, formulated their theories while living in Buddhist communities in Āndhra." They note that the ancient Buddhist sites in the lower Kṛṣṇa Valley, including Amaravati, Nāgārjunakoṇḍā and Jaggayyapeṭa "can be traced to at least the third century BCE, if not earlier." Akira Hirakawa notes the "evidence suggests that many Early Mahayana scriptures originated in South India." The Maurya empire reached its peak at the time of emperor Aśoka, who converted to Buddhism under the influence of his Buddhist wife and Empress consort Devi after the Battle of Kaliṅga. This heralded a long period of stability under the Buddhist emperor. The power of the empire was vast—ambassadors were sent to other countries to propagate Buddhism. Greek envoy Megasthenes describes the wealth of the Mauryan capital. Stupas, pillars and edicts on stone remain at Sanchi, Sarnath and Mathura, indicating the extent of the empire. Emperor Aśoka the Great (304 BCE–232 BCE) was the ruler of the Maurya Empire from 273 BCE to 232 BCE. Buddhist proselytism at the time of king Asoka (260-218 BCE), according to his Edicts. According to legend, emperor Aśoka was overwhelmed by guilt after the conquest of Kaliṅga, following which he accepted Buddhism as personal faith with the help of his Brahmin mentors Rādhāsvāmī and Mañjūśrī. Aśoka established monuments marking several significant sites in the life of Śakyamuni Buddha, and according to Buddhist tradition was closely involved in the preservation and transmission of Buddhism. 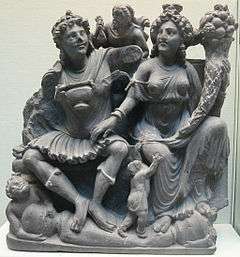 The Ardoxsho and Pharro, 3rd century AD, Takht-i Bahi, Gandhāra, British Museum. Found on Kushan and Gupta coins, they may be Buddhist, Hindu or Persian deities. By 90 BC, Parthians took control of eastern Iran and around 50 BC put an end to last remnants of Greek rule in Afghanistan. By around 7 AD, an Indo-Parthian dynasty succeeded in taking control of Gandhāra. Parthians continued to support Greek artistic traditions in Gandhara. The start of the Gandhāran Greco-Buddhist art is dated to the period between 50 BC and 75 AD. Kuṣāna under emperor Kaniṣka was known as the Kingdom of Gandhāra. The Buddhist art spread outward from Gandhāra to other parts of Asia. He greatly encouraged Buddhism. Before Kaniṣka, Buddha was not represented in human form. In Gandhāra Mahāyāna Buddhism flourished and Buddha was represented in human form. Under the rule of the Pāla and Sena kings, large mahāvihāras flourished in what is now Bihar and Bengal. According to Tibetan sources, five great Mahāvihāras stood out: Vikramashila, the premier university of the era; Nālanda, past its prime but still illustrious, Somapura, Odantapurā, and Jaggadala. The five monasteries formed a network; "all of them were under state supervision" and their existed "a system of co-ordination among them . . it seems from the evidence that the different seats of Buddhist learning that functioned in eastern India under the Pāla were regarded together as forming a network, an interlinked group of institutions," and it was common for great scholars to move easily from position to position among them. The Indian dhyana master Buddhabhadra was the founding abbot and patriarch of the Shaolin Temple. Buddhist monk and esoteric master from South India (6th century), Kanchipuram is regarded as the patriarch of the Ti-Lun school. 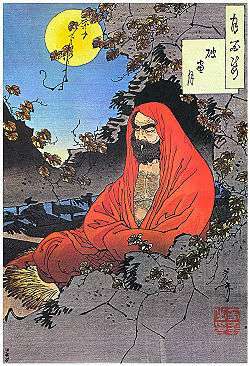 Bodhidharma (c. 6th century) was the Buddhist Bhikkhu traditionally credited as the founder of Zen Buddhism in China. In 580, Indian monk Vinītaruci travelled to Vietnam. This, then, would be the first appearance of Vietnamese Zen, or Thien Buddhism. Guru Rinpoche, the patron saint of Sikkim. The 118 foot statue in Namchi, South Sikkim, is the tallest statue of the saint in the world. Padmasambhava, in Sanskrit meaning "lotus-born", is said to have brought Tantric Buddhism to Tibet in the 8th century. In Bhutan and Tibet he is better known as "Guru Rinpoche" ("Precious Master") where followers of the Nyingma school regard him as the second Buddha. Śāntarakṣita, abbot of Nālanda and founder of the Yogacara-Madhyamaka is said to have helped Padmasambhava establish Buddhism in Tibet. General Ikhtiar Uddin Muhammad Bin Bakhtiyar Khilji sacked the great Buddhist shrines at Nālanda. The decline of Buddhism has been attributed to various factors. Regardless of the religious beliefs of their kings, states usually treated all the important sects relatively even-handedly. This consisted of building monasteries and religious monuments, donating property such as the income of villages for the support of monks, and exempting donated property from taxation. Donations were most often made by private persons such as wealthy merchants and female relatives of the royal family, but there were periods when the state also gave its support and protection. In the case of Buddhism, this support was particularly important because of its high level of organization and the reliance of monks on donations from the laity. State patronage of Buddhism took the form of land grant foundations. Numerous copper plate inscriptions from India as well as Tibetan and Chinese texts suggest that the patronage of Buddhism and Buddhist monasteries in medieval India was interrupted in periods of war and political change, but broadly continued in Hindu kingdoms from the start of the common era through early 2nd millennium CE. Modern scholarship and recent translations of Tibetan and Sanskrit Buddhist text archives, preserved in Tibetan monasteries, suggest that through much of 1st millennium CE in medieval India (and Tibet as well as other parts of China), Buddhist monks owned property and were actively involved in trade and other economic activity, after joining a Buddhist monastery. With the Gupta dynasty (~4th to 6th century), the growth in ritualistic Mahayana Buddhism, and the adoption of Buddhist ideas into Hindu schools, the differences between Buddhism and Hinduism blurred, and Vaishnavism, Shaivism and other Hindu traditions became increasingly popular, and Brahmins developed a new relationship with the state. As the system grew, Buddhist monasteries gradually lost control of land revenue. In parallel, the Gupta kings built Buddhist temples such as the one at Kushinagara, and monastic universities such as those at Nalanda, as evidenced by records left by three Chinese visitors to India. According to Hazra, Buddhism declined in part because of the rise of the Brahmins and their influence in socio-political process. According to Randall Collins, Richard Gombrich and other scholars, Buddhism's rise or decline is not linked to Brahmins or the caste system, since Buddhism was "not a reaction to the caste system", but aimed at the salvation of those who joined its monastic order. The 11th century Persian traveller Al-Biruni writes that there was 'cordial hatred' between the Brahmins and Sramana Buddhists. Buddhism was also weakened by rival Hindu philosophies such as Advaita Vedanta, growth in temples and an innovation of the bhakti movement. Advaita Vedanta proponent Adi Shankara is believed to have "defeated Buddhism" and established Hindu supremacy. This rivalry undercut Buddhist patronage and popular support. The period between 400 CE and 1000 CE thus saw gains by the Vedanta school of Hinduism over Buddhism and Buddhism had vanished from Afghanistan and north India by early 11th century. India was now Brahmanic, not Buddhistic; Al-Biruni could never find a Buddhistic book or a Buddhist person in India from whom he could learn. According to some scholars such as Lars Fogelin, the decline of Buddhism may be related to economic reasons, wherein the Buddhist monasteries with large land grants focussed on non-material pursuits, self-isolation of the monasteries, loss in internal discipline in the sangha, and a failure to efficiently operate the land they owned. Chinese scholars traveling through the region between the 5th and 8th centuries, such as Faxian, Xuanzang, I-ching, Hui-sheng, and Sung-Yun, began to speak of a decline of the Buddhist Sangha, especially in the wake of the Hun invasion from central Asia. Xuanzang, the most famous of Chinese travellers, found “millions of monasteries” in north-western India reduced to ruins by the Huns. 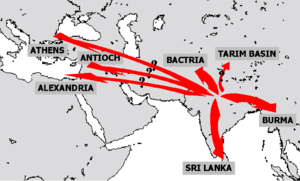 The Muslim conquest of the Indian subcontinent was the first great iconoclastic invasion into South Asia. 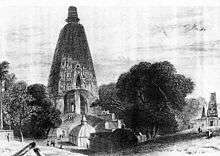 By the end of twelfth century, Buddhism had mostly disappeared, with the destruction of monasteries and stupas in medieval northwest and western India (now Pakistan and north India). In the northwestern parts of medieval India, the Himalayan regions, as well regions bordering central Asia, Buddhism once facilitated trade relations, states Lars Fogelin. With the Islamic invasion and expansion, and central Asians adopting Islam, the trade route-derived financial support sources and the economic foundations of Buddhist monasteries declined, on which the survival and growth of Buddhism was based. The arrival of Islam removed the royal patronage to the monastic tradition of Buddhism, and the replacement of Buddhists in long-distance trade by the Muslims eroded the related sources of patronage. In the Gangetic plains, Orissa, northeast and the southern regions of India, Buddhism survived through the early centuries of the 2nd millennium CE. The Islamic invasion plundered wealth and destroyed Buddhist images, and consequent take over of land holdings of Buddhist monasteries removed one source of necessary support for the Buddhists, while the economic upheaval and new taxes on laity sapped the laity support of Buddhist monks. 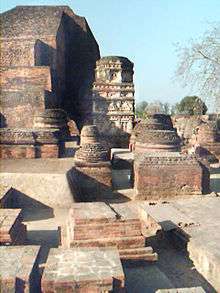 Monasteries and institutions such as Nalanda were abandoned by Buddhist monks around 1200 CE, who flee to escape the invading Muslim army, after which the site decayed over the Islamic rule in India that followed. The last empire to support Buddhism, the Pala dynasty, fell in the 12th century, and Muslim invaders destroyed monasteries and monuments. 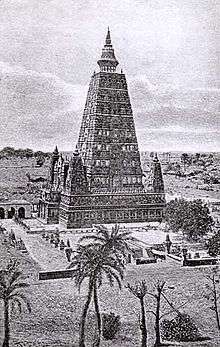 According to Randall Collins, Buddhism was already declining in India before the 12th century, but with the pillage by Muslim invaders it nearly became extinct in India in the 1200s. In the 13th century, states Craig Lockard, Buddhist monks in India escaped to Tibet to escape Islamic persecution; while the monks in western India, states Peter Harvey, escaped persecution by moving to south Indian Hindu kingdoms that were able to resist the Muslim power. Some scholars suggest that a part of the decline of Buddhist monasteries was because it was detached from everyday life in India and did not participate in the ritual social aspects such as the rites of passage (marriage, funeral, birth of child) like other religions. In 1892, Kripasaran Mahasthavir founded the Bengal Buddhist Association (Bauddha Dharmankur Sabha) in Calcutta. Kripasaran (1865–1926) was instrumental in uniting the Buddhist community of Bengal and North East India. He built other branches of the Bengal Buddhist Association at Shimla (1907), Lucknow (1907), Dibrugarh (1908), Ranchi (1915), Shillong (1918), Darjeeling (1919), Tatanagar Jamshedpur (1922), as well as in Sakpura, Satbaria, Noapara, Uninepura, Chittagong Region in present-day Bangladesh. The 14th Dalai Lama departed Tibet in 1959, when Indian Prime Minister Jawaharlal Nehru offered to permit him and his followers to establish a "government-in-exile" in Dharamsala. Tibetan exiles have settled in the town, numbering several thousand. Many of these exiles live in Upper Dharamsala, or McLeod Ganj, where they established monasteries, temples and schools. The town is sometimes known as "Little Lhasa", after the Tibetan capital city, and has become one of the centers of Buddhism in the world. Many settlements for Tibetan refugee communities came up across many parts of India on the lands offered by the Government of India. Some of the biggest Tibetan settlements in exile are in the state of Karnataka. The Dalai Lama's brother, Gyalo Thondup, himself lives in Kalimpong and his wife established the Tibetan Refugee Centre in Darjeeling . His Holiness the 17th Karmapa also arrived in India in 2000 and continues education and has taken traditional role to head Karma Kagyu sect of Tibetan Buddhism and every year leads the Kagyu Monlam in Bodh Gaya attended by thousands of monks and followers . Palpung Sherabling monastery seat of His Holiness the 12th Tai Situpa located in Kangra, Himachal Pradesh is the largest Kagyu monastery in India and has become an important centre of Tibetan Buddhism. His Holiness Penor Rinpoche, the head of Nyingma, the ancient school of Tibetan Buddhism re-established a Nyingma monastery in Bylakuppe, Mysore. This is the largest Nyingma monastery today. Monks from Himalayan regions of India, Nepal, Bhutan and from Tibet join this monastery for their higher education. HH Penor Rinpoche also founded Thubten Lekshey Ling, a dharma center for lay practitioners in Bangalore. Vajrayana Buddhism and Dzogchen (maha-sandhi) meditation again became accessible to aspirants in India after that. A Buddhist revivalist movement among Dalit Indians was initiated in 1890s by socialist leaders such as Iyothee Thass, Bhagya Reddy Varma, and Damodar Dharmananda Kosambi. In the 1950s, Dr. B. R. Ambedkar turned his attention to Buddhism and travelled to Sri Lanka (then Ceylon) to attend a convention of Buddhist scholars and monks. While dedicating a new Buddhist vihara near Pune, Dr. B. R. Ambedkar announced that he was writing a book on Buddhism, and that as soon as it was finished, he planned to make a formal conversion to Buddhism. Dr. B. R. Ambedkar twice visited Burma in 1954; the second time in order to attend the third conference of the World Fellowship of Buddhists in Rangoon. In 1955, he founded the Bharatiya Bauddha Mahasabha, or the Buddhist Society of India. He completed his final work, The Buddha and His Dhamma, in 1956. It was published posthumously. After meetings with the Sri Lankan Buddhist monk Hammalawa Saddhatissa, Ambedkar organised a formal public ceremony for himself and his supporters in Nagpur on 14 October 1956. Accepting the Three Refuges and Five Precepts from a Buddhist monk in the traditional manner, Ambedkar completed his own conversion. He then proceeded to convert an estimated 500,000 of his supporters who were gathered around him. Taking the 22 Vows, Ambedkar and his supporters explicitly condemned and rejected Hinduism and Hindu philosophy.This was the world's biggest mass religious conversion; it is celebrated by Buddhists every year at Nagpur; 1-1.5 million Buddhists gather there every year for the ceremony. He then traveled to Kathmandu in Nepal to attend the Fourth World Buddhist Conference. His final manuscript, The Buddha or Karl Marx, remains unfinished; he died on 6 December 1956. The Buddhist meditation tradition of Vipassana meditation is growing in popularity in India. Many institutions—both government and private sector—now offer courses for their employees. This form is mainly practiced by the elite and middle class Indians. This movement has spread to many other countries in Europe, America and Asia. ↑ UNESCO World Heritage Centre. 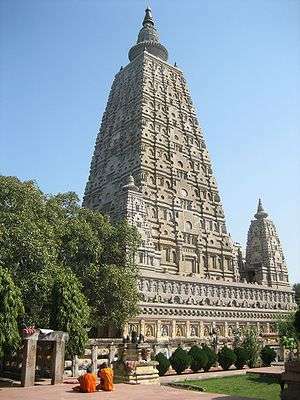 "Mahabodhi Temple Complex at Bodh Gaya". Retrieved 27 February 2015. ↑ Monier-Williams, Monier. Dictionary of Sanskrit. OUP. 1 2 3 4 5 Wendy Doniger (1999). Merriam-Webster's Encyclopedia of World Religions. Merriam-Webster. pp. 155–157. ISBN 978-0-87779-044-0. ↑ Beyond Enlightenment: Buddhism, Religion, Modernity by Richard Cohen. Routledge 1999. ISBN 0-415-54444-0. pg 33. "Donors adopted Sakyamuni Buddha’s family name to assert their legitimacy as his heirs, both institutionally and ideologically. To take the name of Sakya was to define oneself by one’s affiliation with the Buddha, somewhat like calling oneself a Buddhist today. ↑ Sakya or Buddhist Origins by Caroline Rhys Davids (London: Kegan Paul, Trench, Trubner, 1931) pg 1. "Put away the word “Buddhism” and think of your subject as “Sakya.” This will at once place you for your perspective at a true point . . You are now concered to learn less about 'Buddha' and 'Buddhism,' and more about him whom India has ever known as Sakya-muni, and about his men who, as their records admit, were spoken of as the Sakya-sons, or men of the Sakyas." ↑ Beyond Enlightenment: Buddhism, Religion, Modernity by Richard Cohen. Routledge 1999. ISBN 0-415-54444-0. pg 33. Bauddha is "a secondary derivative of buddha, in which the vowel’s lengthening indicates connection or relation. Things that are bauddha pertain to the buddha, just as things Saiva relato to Siva and things Vaisnava belong to Visnu. . . baudda can be both adjectival and nominal; it can be used for doctrines spoken by the buddha, obejects enjoyed by him, texts attributed to him, as well as individuals, communities, and societies that offer him reverence or accept ideologies certified through his name. Strictly speaking, Sakya is preferable to bauddha since the latter is not attested at Ajanta. In fact, as a collective noun, bauddha is an outsider’s term. The bauddha did not call themselves this in India, though they did sometimes use the word adjectivally (e.g., as a possessive, the buddha’s)." ↑ Jerry Bentley, Old World Encounters: Cross-Cultural Contacts and Exchanges in Pre-Modern Times (New York: Oxford University Press, 1993), 43. ↑ Jerry Bentley, Old World Encounters: Cross-Cultural Contacts and Exchanges in Pre-Modern Times (New York: Oxford University Press, 1993), 47-48. ↑ "The Truth of Babri Mosque". Retrieved 6 May 2015. ↑ "Fa-hsien: A Record of Buddhistic Kingdoms: Chapter XXVII: Patalipttra or Patna, in Magadha. King Aśoka's Spirit Built Palace and Halls. The Buddhist Brahman, Radha-Sami. Dispensaries and Hospitals.". ↑ John M. Rosenfield (1967). The Dynastic Arts of the Kushans. University of California Press. pp. xxiii, 74–76, 82, 94–95. 1 2 Damien Keown (2004). A Dictionary of Buddhism. Oxford University Press. pp. 208–209. ISBN 978-0-19-157917-2. ↑ Heather Elgood (2000). Hinduism and the Religious Arts. Bloomsbury Academic. p. 150. ISBN 978-0-8264-9865-6. ↑ "Strabo, Geography, NOTICE.". Retrieved 27 February 2015. ↑ The Founder Of Shaolinsi (Official Shaolin Monastery Portal in English) Archived 6 December 2006 at the Wayback Machine. ↑ Concise Encyclopædia Britannica Article on Bodhidharma Archived 5 September 2007 at the Wayback Machine. ↑ Randall Collins, The Sociology of Philosophies: A Global Theory of Intellectual Change. Harvard University Press, 2000, pages 180, 182. ↑ Hajime Nakamura (1980). Indian Buddhism: A Survey with Bibliographical Notes. Motilal Banarsidass. pp. 145–148 with footnotes. ISBN 978-81-208-0272-8. ↑ Akira Shimada (2012). Early Buddhist Architecture in Context: The Great Stūpa at Amarāvatī (ca. 300 BCE-300 CE). BRILL Academic. pp. 200–204. ISBN 978-90-04-23326-3. 1 2 Gregory Schopen (1997). Bones, Stones, and Buddhist Monks: Collected Papers on the Archaeology, Epigraphy, and Texts of Monastic Buddhism in India. University of Hawaii Press. pp. 259–278. ISBN 978-0-8248-1870-8. ↑ Gregory Schopen (2004). Buddhist Monks and Business Matters: Still More Papers on Monastic Buddhism in India. University of Hawaii Press. pp. 1–16. ISBN 978-0-8248-2774-8. ↑ Huaiyu Chen (2007). The Revival of Buddhist Monasticism in Medieval China. Peter Lang. pp. 132–149. ISBN 978-0-8204-8624-6. ↑ Randall Collins, The Sociology of Philosophies: A Global Theory of Intellectual Change. Harvard University Press, 2000, page 207-211. ↑ Robert Stoddard (2010). "The Geography of Buddhist Pilgrimage in Asia". Pilgrimage and Buddhist Art. Yale University Press. 178: 3–4. ↑ Hartmut Scharfe (2002). Handbook of Oriental Studies. BRILL Academic. pp. 144–153. ISBN 90-04-12556-6. ↑ Kanai Lal Hazra (1995). The Rise And Decline Of Buddhism In India. Munshiram Manoharlal. pp. 371–385. ISBN 978-81-215-0651-9. ↑ Richard Gombrich (2012). Buddhist Precept & Practice. Routledge. pp. 344–345. ISBN 978-1-136-15623-6. ↑ Muhammad ibn Ahmad Biruni; Edward C. Sachau (Translator) (1910). Alberuni's India: An Account of the Religion, Philosophy, Literature, Geography, Chronology, Astronomy, Customs, Laws and Astrology of India about AD 1030. Kegan Paul, Trench, Trubner & Co. Ltd., London. p. 21. ↑ "How Adi Shankaracharya Defeated Buddhism ?". ↑ Randall Collins, The Sociology of Philosophies: A Global Theory of Intellectual Change. Harvard University Press, 2000, pages=189, 190. ↑ "BBC - Religions - Hinduism: History of Hinduism". Retrieved 27 February 2015. ↑ Muhammad ibn Ahmad Biruni; Edward C. Sachau (Translator) (1910). Alberuni's India: An Account of the Religion, Philosophy, Literature, Geography, Chronology, Astronomy, Customs, Laws and Astrology of India about AD 1030. Kegan Paul, Trench, Trubner & Co. Ltd., London. pp. xlv, xlvii, 249. 1 2 3 4 Lars Fogelin (2015). 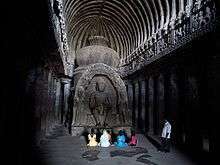 An Archaeological History of Indian Buddhism. Oxford University Press. pp. 229–230. ISBN 978-0-19-994823-9. ↑ Encyclopaedia Britannica. "Historical Development of Buddhism in India - Buddhism under the Guptas and Palas". Retrieved 12 September 2015. ↑ Encyclopaedia Britannica. "Historical Development of Buddhism in India - Buddhism under the Guptas and Palas". Retrieved 13 September 2015. 1 2 3 McLeod, John, "The History of India", Greenwood Press (2002), ISBN 0-313-31459-4, pg. 41-42. 1 2 André Wink (1997). Al-Hind the Making of the Indo-Islamic World. BRILL Academic. pp. 348–349. ISBN 90-04-10236-1. ↑ Peter Harvey (2013). An Introduction to Buddhism: Teachings, History and Practices. Cambridge University Press. p. 194. ISBN 978-0-521-85942-4. , Quote: "From 986 CE, the Muslim Turks started raiding northwest India from Afghanistan, plundering western India early in the eleventh century. Force conversions to Islam were made, and Buddhist images smashed, due to the Islamic dislike of idolarty. Indeed in India, the Islamic term for an 'idol' became 'budd'." ↑ Craig Lockard (2007). Societies, Networks, and Transitions: Volume I: A Global History. University of Wisconsin Press. p. 364. ISBN 0-618-38612-2. ↑ "BBC NEWS - South Asia - India's youth hit the web to worship". Retrieved 27 February 2015. Doniger, Wendy (2000). Merriam-Webster Encyclopedia of World Religions. Encyclopædia Britannica. p. 1378. ISBN 0-87779-044-2.